Main TIPS Page - click here! 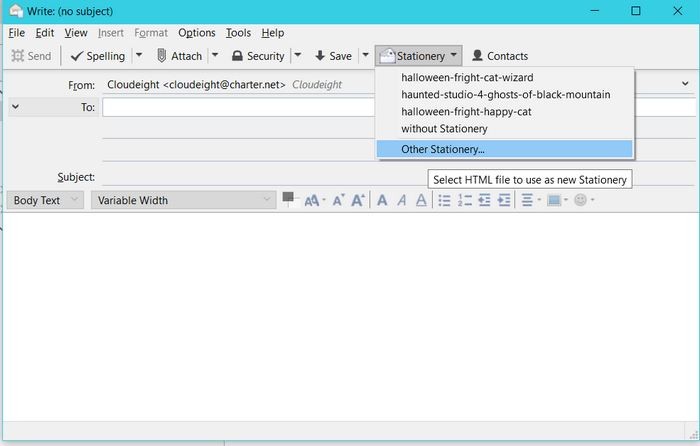 Stationery Plugin: To use Cloudeight Stationery for Thunderbird you'll need to install the stationery plug-in. If we installed Thunderbird for you, you already have the stationery plug-in, and you're ready to go! Click here if you need to install the add-on. Cloudeight Direct Setup: Interested in having us install and setup Thunderbird for you? Click here for Details! How to Download Stationery Collection: For help with this, click here for instructions. Step 1 - Set Stationery Folder: Go to Documents and create a folder you want all your Thunderbird Stationery stored in for easy access. We made a folder called My Stationery. Once this is done, open Thunderbird, click Tools (from menu bar at the top), Stationery Options, and then when the window opens, choose Options. 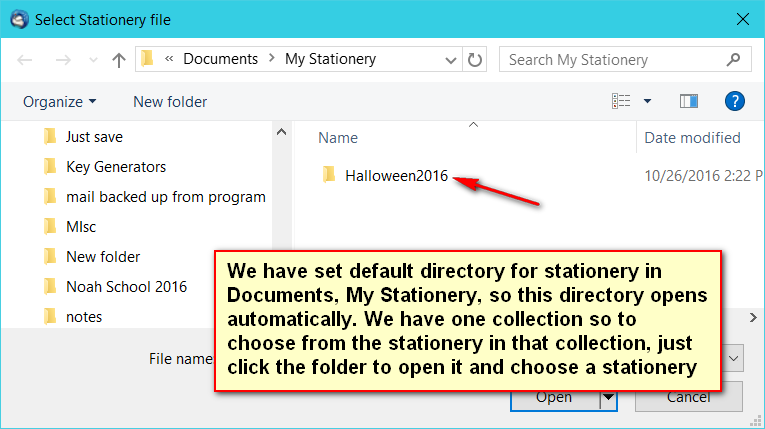 Tick "Any folder" and browse to the folder you created for your stationery. Click here to see screenshots. Note: You only have to do this once! We also made a video of this step - click here to view the video. Step 2: Choose a stationery to send - Click Write from top menu, and and when your mail opens, choose Stationery, Other Stationery. The folder you choose for stationery will open. Choose the stationery you want to use. If you kept a collection in its own folder, click the folder to open and choose the one you want to use by double-click or choose Open. Now you are ready to write and send your stationery! Click here to see screenshots. 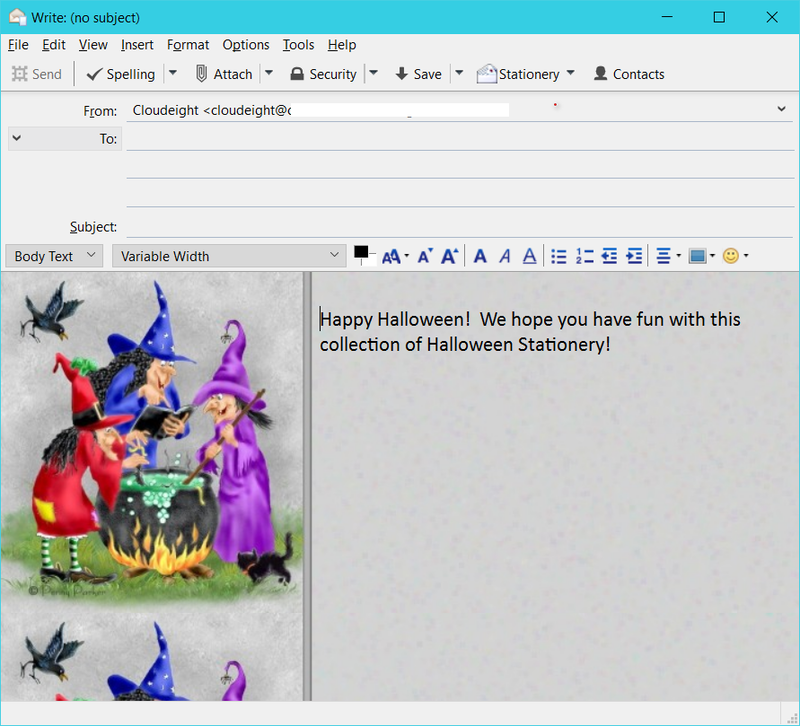 We also made a video to help you use stationery in Thunderbird; click here to view our video. 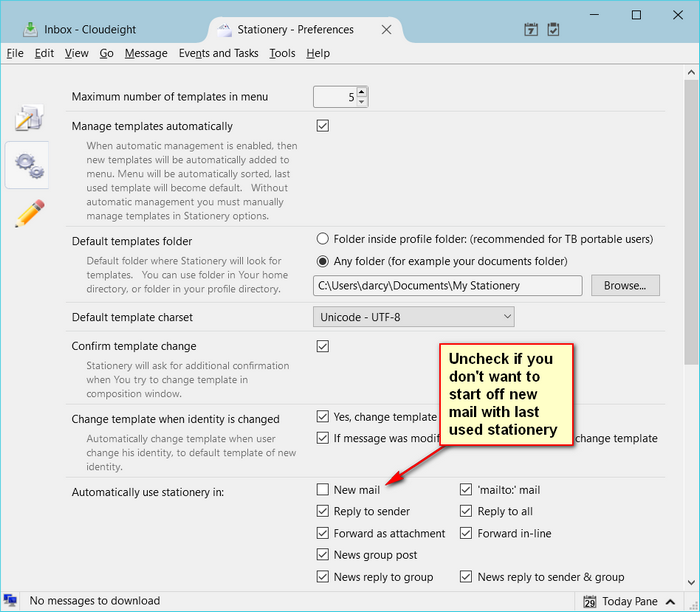 Step 3: Send email without Stationery - Go to Tools, Stationery Options, Options, and uncheck Use Stationery for new mail. Click here to see screenshot. Otherwise, if you have used a stationery, the next time you write an email or replay to an email, the stationery you used last will appear in the new mail. That is ok though... to send without stationery, click Stationery, without Stationery and your mail will be "plain". Click here to see screenshot. Tip! Once you use a stationery, it will appear in your drop down list for quick access. You can organize the drop down list, or remove stationery from the drop down list. To do this, click Tools, Stationery Options, and click the Templates tab on the left. Happy Organizing!! **Click Write from top menu, then when mail opens choose Stationery, Other Stationery. The folder you choose for stationery will open. Choose the stationery you want to use. 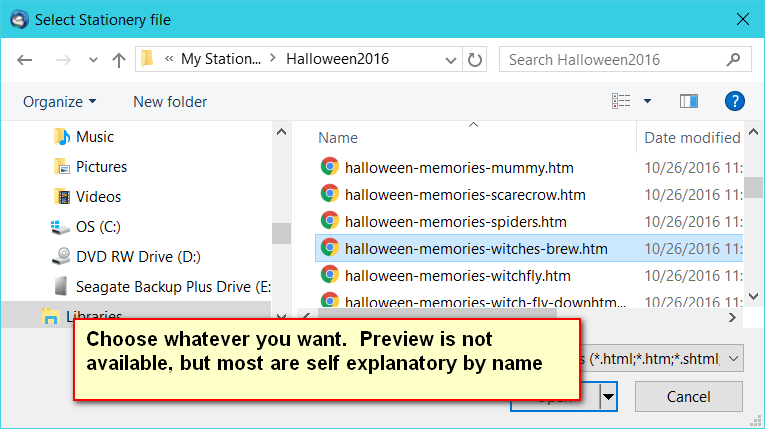 If you kept a collection in its own folder, click the folder to open and choose the one you want to use by double-click or choose Open. Now you are ready to write and send your stationery! First, Click Write from top menu, then when mail opens, click Stationery, Other Stationery. Or if you see some you have used before in the dropdown list, you can choose from the list. You can see we have a few we have used already. Choose the one you want to use by double-click or choose Open. Now you are ready to write and send your stationery! 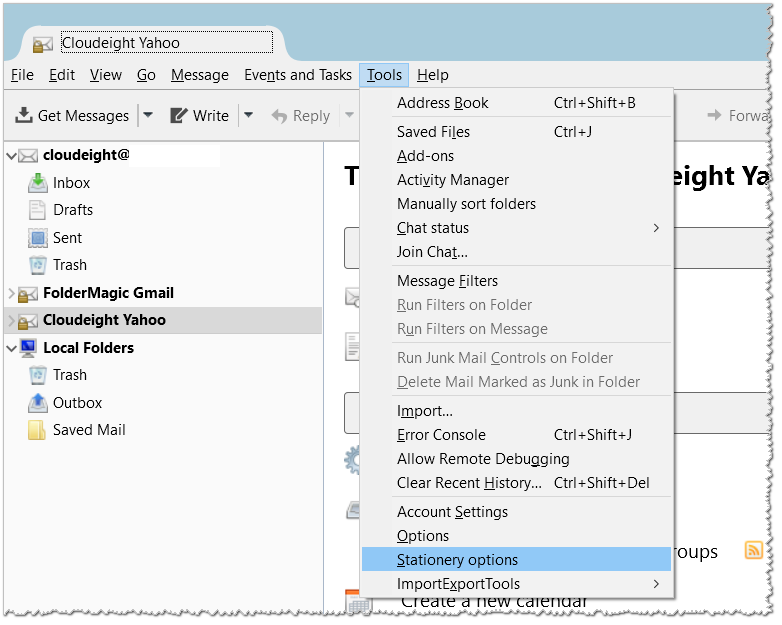 Go to Tools, Stationery Options, Options, and uncheck Use Stationery for new mail. 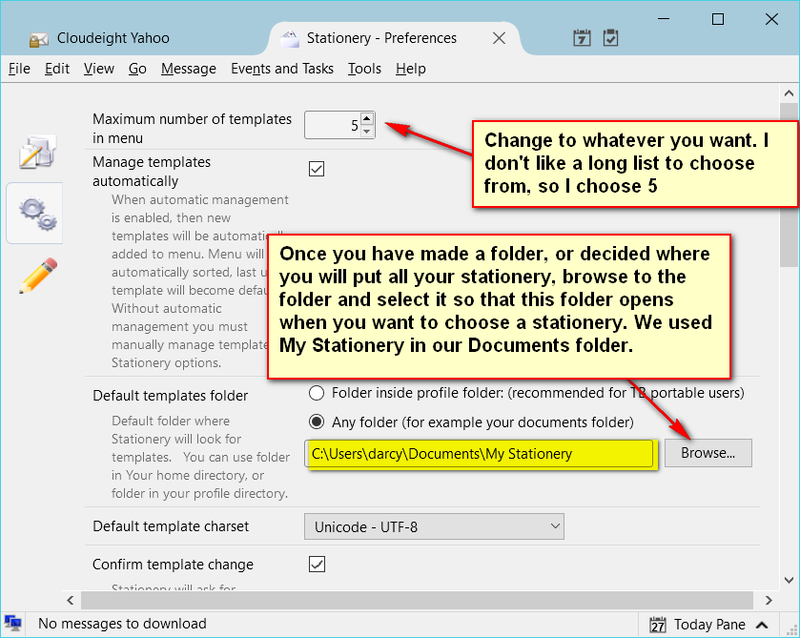 Send email without Stationery - If you have used a stationery, and you did not disable for new stationery, the next time you write an email or reply to an email, the stationery will appear in the new mail. 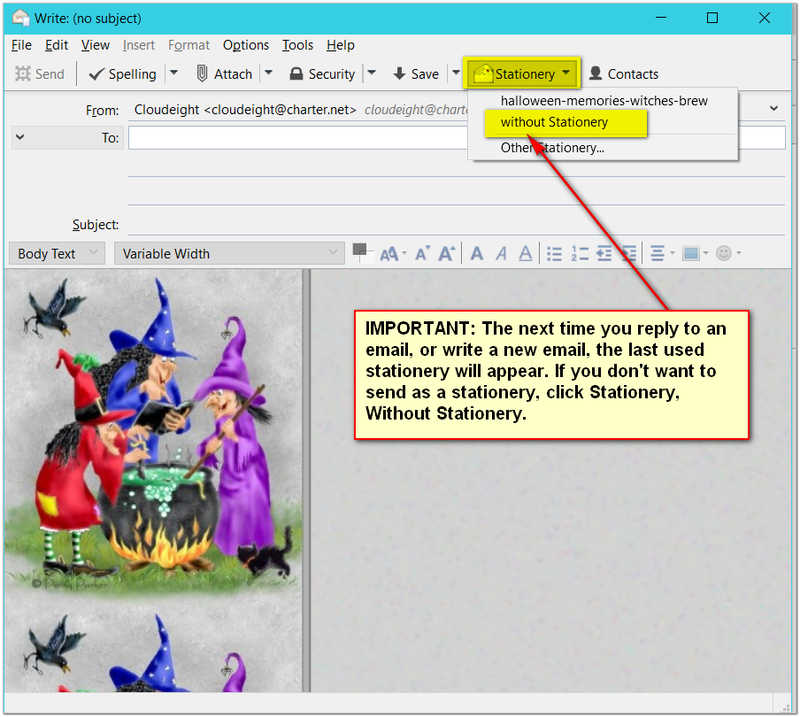 To send without stationery, click Stationery, without Stationery in your open email and your mail will be "plain". See below.